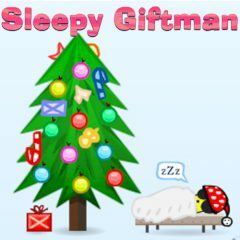 Help the Sleepy Giftman to deliver all gifts to the Christmas tree. It is not so easy as it seems to be at first. You can use different objects and be ready to any impediments. We know that you are the only one, who can cope with it! Soon is Christmas! This is the best time in the whole year! There will be so many gifts. Do you like any gifts? Yeah, we know that! In this game you have to help the main hero to deliver all gifts and put them near the Christmas tree. Try to use all your skills and thinking abilities. Sometimes you will need the help of other objects. We know that you will cope with easily. Just be ready all the time. Use the arrow keys to move and X to grab any objects. Just have faith in yourself and help him at any rate!